Just before the beginning of an international sporting competition, you may wonder why the Spanish athletes don’t move their lips when their national anthem is being played. The answer is simple: it doesn’t have any lyrics. What’s more, if Spaniards had to write lyrics to represent them nationally, they would really have a hard time; the main challenge for this would be: which language to use? In Madrid, the nation’s capital, Castilian is without a shadow of a doubt the official language. However, in Barcelona, Victoria or A Coruña, it would seem normal to sing the national anthem in Catalan, Basque or Galician respectively; it might also be unthinkable not to do so. Spaniards take great pride in these provincial distinctions and that feeling unifies them better than any language would do. The sense of regional identity is very strong in Spain and the language, whether it’s a dialect or merely a special accent, is a hallmark of people’s origin of which they feel exceedingly proud. In the province of Catalonia for instance, I am often told that people are Catalan before being Spanish. In most public schools there, Castilian is taught as a ‘foreign language’ and some people living in remote villages can hardly speak it. At first sight, this language variety in Spain looks like cultural wealth, but listening to Spaniards arguing about each other’s regional claims reveals a deep-rooted discord among them. When it comes to governing, unifying laws, standardizing public expenses, the regions play hardball with the central government. Not only does this provincial pride divide the Spaniards and prevent them from forming a united nation, but it also leads their country into disorganization and bankruptcy. Only once in history did it happen that all the provinces acted as one single nation. It was under the reign of the Catholic kings, when all the Christian kingdoms of Spain got together to boot the Muslims off the Peninsula. However, more than 500 years later, Spaniards cling on to their cherished differences in such a way that I don’t believe any issue could bring them together, whether it’s an international sporting competition or a national economic crisis. The influence of foreign languages doesn’t make communication better either. Both English, which is widely studied throughout the country, and French, whose influence naturally comes from the neighbouring state, are regularly misused within the local language. However, these multilingual attempts can produce unexpected gems. The other day for example, I came across a shop that sells articles for pets. It was named ‘Pet à porter’. 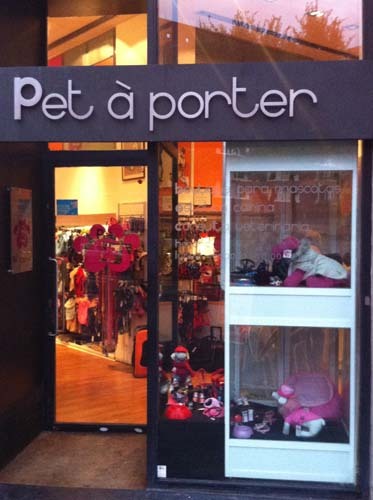 I’m not so sure a Frenchman would go into this shop, for ‘pet’ means ‘fart’, and this is hardly something you’d want to wear. You are amazing =) you made me smile with this pic, it was really the best example you could be found.